This is an old mitsuore ningyo (triple jointed doll) from the Meiji period (1868-1912) or possibly earlier (late Edo period). The body of this doll was made with the Ikkanbari method. In this method, layers of washi (Japanese paper) were glued (lacquered) together over a wooden mold to form the shape of the body parts. It was then coated with layers of gofun, the mixture of ground oyster shells and animal glue. The eyes of the doll are painted from the inside, the arms can be shaped to a certain extent and all the joints, including the neck and hands, are in good condition though a foot fell down twice during the photo session. The hands and feet are made out of a clay-like heavy material. The amazing thing is that there is almost no damage for this over 100 years old doll. Some Gosho ningyo from late Edo period were made with the same technique. 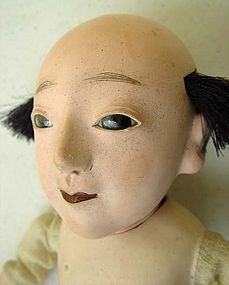 This type of doll was almost completely replaced later by toso (mixture of saw dust with glue), plastic or rubber dolls. The kimono that this doll is wearing is made from silk, not cotton as it appears; it was damaged on the liner (covers only the lower half) which was recently replaced with the old "ohshima" tsumugi silk. The fabric of kimono looks in good condition but it is old - you can see holes (caused by aging not by bag bites) when it is looked through lights (upper back area). Obi is newly made from fairly old soft silk. All hand sewn. Photos are still mixed with kimono pre and after the repair. 10 1/8" tall.